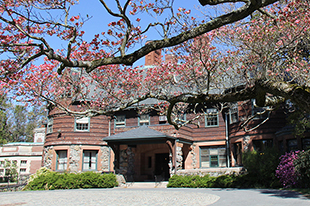 The BAC is looking for a motivated and enthusiastic student who would like to become a Resident Assistant (RA) at the BAC’s residence hall located on the campus of Pine Manor College (Chestnut Hill). An RA is a live-in staff member that provides assistance to residents and helps to build and maintain a safe and enjoyable living environment for all BAC students within the residence hall. An RA will assist new residents during check-in, help those who are locked out of their rooms, respond to emergency situations, mediate roommate conflicts, and refer residents to campus professionals for additional information or assistance. The BAC Resident Assistant will also work in collaboration with Pine Manor RAs to plan community building activities for their residents throughout the academic year and enforce the rules of the residence hall. Included in the RA benefits package are meals at the Pine Manor Dining Hall. The Dining Hall, which is operated by ARAMARK, provides 14 meals per week, including brunch and dinner on weekends. These include hot and cold entrees and many cook-to-order options. Dining halls are shared with students from PMC students and other small local colleges. For more information, please contact Jeff Morris, the BAC coordinator of Student Life, at 617.585.0272 or jeff.morris@the-bac.edu.